More than 60 Minneapolis firefighters and at least one firehouse cat have died in the line of duty since the department was founded in 1879. Just a kitten when he was left at Station No. 10 in 1935, Mickey learned how to slide down the fire pole when the alarm sounded. That trick earned him the admiration of fellow firefighters and a feature role in a Pathe newsreel short. He answered the bell for the last time one August night in 1937. Minneapolis Star editors put his death on the front page, above the fold. Mickey the cat is dead. Ordinarily the death of a cat wouldn’t make news. But Mickey was no ordinary cat, for he had won movie stardom and widespread publicity as a fireman feline. Mickey died in the “line o’ duty” Sunday night. 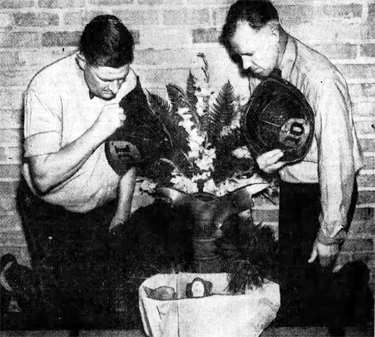 The original caption: "Firemen Ladimer Aubrecht and Tom Broden Pay Respects to Mickey: Un-cat-like, Mickey fell on his neck." When an alarm came in at 10:17 p.m., Mickey made a leap for the pole down which firemen at No. 10 station slide to the first floor, but his paws didn’t get a firm enough grip on the pole and he plunged to the floor. No. 10 station is at 19 Fourth street N.
The apparatus left without Mickey. When it returned and the men jumped off, they found Mickey at the base of the pole. He was dead, his neck broken by the fall. A pall fell over the station. It was almost like losing one of the boys. Preparations proceeded for Mickey’s burial. Someone found a discarded grape box. Mickey was groomed and amid somber decorations his body lies in state in the grape box today. Burial probably will be Tuesday in a small plot on a two acre tract owned by Fireman Frank Leighton at Parker’s lake. Firemen who formerly were at No. 10 station came back today to pay their respects to Mickey. Chief Earl Traeger also dropped into the station. Records of the Minneapolis fire department did not recognize Mickey but at No. 10 station he was as much a part of the personnel as any other fireman. When Mickey came to the station two years ago, left there as a kitten by an unknown woman, he was just another cat. But the firemen, particularly Capt. Edward Rylander, decide to teach him a few tricks. One of these was answering alarms and sliding down the pole from the second to the first floor. So proficient did Mickey become that Pathe News Reel starred him in a short a year ago. The short was released throughout the country and Mickey became famous.